Introduction Clinician involvement in clinical trials research represents a significant contribution to addressing important research questions in primary care. Aim This study aimed to explore the experiences of pharmacists recruiting patients to a low back pain (LBP) clinical trial conducted in Australia, the challenges they experienced and screening and management of people with acute LBP. Ethical approval This study received ethical approval (No. 13799) through the University of Sydney Human Research Ethics Committee. Methods A convenience sample of 15 pharmacists who successfully recruited people to the clinical trial and 15 pharmacists who collaborated on the trial but did not recruit any participants were invited to complete an open ended questionnaire. The questionnaire consisted of six items framed to evaluate pharmacists’ views on participation in the LBP clinical trial, ideas for addressing the challenges they experienced and screening and management of people with LBP who present to the pharmacy. Results A total of 30 pharmacists completed the questionnaire. Pharmacists identified lack of time and patient reluctance to participate as the major challenges to recruiting participants to the LBP clinical trial. Greater patient incentives and a more efficient paperwork system have been recommended as strategies to overcome these challenges. The recruiters and non-recruiters held similar views on pharmacological management of acute LBP and complied with guideline recommended care; although their views on the non-pharmacological management of acute LBP were less consistent with the guidelines. Discussion The experiences of pharmacists evaluated in this study has broadened the understanding around challenges to recruitment for a placebo controlled trial and identified gaps which can be addressed in future training and education of pharmacists. Conclusion This study has identified time pressure as the major barrier to recruitment of participants to the LBP clinical trial. Education of pharmacists on the appropriate non-pharmacological management of people with LBP and screening for possible red flag conditions is required. We would like to thank all the pharmacists who participated in this study. This research received no specific funding from any funding agency in the public, commercial or not-for-profit sectors. CAS is supported by an Australian Postgraduate Award. CGM is supported by a research fellowship funded by the Australian Research Council. 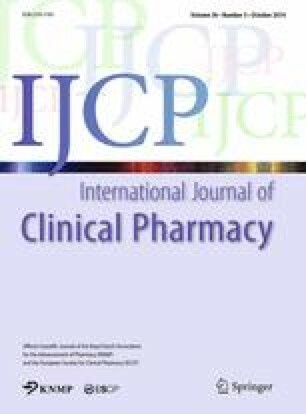 Community pharmacists as an accelerant for clinical trial recruitment (2013). http://prod.mckesson.s3.amazonaws.com/pdf/McKessonStudyLinkWhitePaper.pdf. Accessed 28 June 2014. Australian Institute of Health and Welfare: General Characteristics of persons involved in health and community services occupations. http://www.aihw.gov.au/publication-detail/?id=6442468220&tab=3Accessed July 2013. Williams CM, Maher CG, Latimer J, McLachlan AJ, Hancock MJ, Day RO, et al. Efficacy of paracetamol for acute low-back pain: a double-blind, randomised controlled trial. Lancet. 2014;doi. 10.1016/S0140-6736(08)61345-8.